Overview - A charismatic bandit must outsmart the sheriff trying to catch him and a double-dealing Mexican beauty in this Western that was nominated for 5 Academy Awards®, including Best Picture. Featuring an Oscar®-Winning performance by Warner Baxter as The Cisco Kid, 'In Old Arizona' is a must-own cinematic treasure for any classic film fan. Some classic films are both historically important and stand the test of time to remain enduring pieces of motion picture art. Others, however, only meet the fist half of that equation. Irving Cummings' 1928 western, 'In Old Arizona,' is an example of such a film. On the one hand, the movie represents an important cinematic milestone -- it was the first talkie in its genre and the first sound film to feature sequences shot outdoors. On the other hand, the picture lacks the visual resonance or narrative depth that defines most timeless classics, making its dated storytelling and moviemaking flaws all the more apparent. It's still a worthwhile and technically significant achievement, mind you, but its place within the evolution of cinema sadly outweighs its lasting artistic merit. 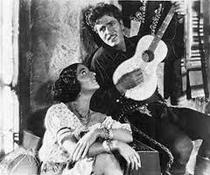 Based on the O. Henry short story "The Caballero's Way," the film follows the infamous Cisco Kid (Warner Baxter), a charming bandit who is on the run from the law. 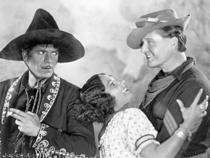 When an army sergeant, Mickey Dunn (Edmund Lowe), sets out to capture the outlaw, the thief retreats to the home of his lover, Tonia (Dorothy Burgess), to hide out. But as Dunn tries to seduce Tonia, the woman's loyalties are tested, potentially spelling doom for the Cisco Kid. In his Academy Award winning performance, Warner Baxter proves to be the film's high point, and his turn as the Cisco Kid brings an appropriate amount of likeable charisma to the fabled anti-hero. Baxter plays up the romantic aspects of the character and imbues the role with a slightly arrogant swagger and flippantly carefree attitude. The thief hides in plain sight and seems to take pleasure in the fact that his potential captors have no idea who he is. This leads to a few amusing and faintly tense scenes early on. Sadly, Edmund Lowe and Dorothy Burgess aren't quite as effective in their parts. Lowe's style of early talkie acting (though certainly understandable and expected given the time period) is rather annoying and Burgess' character is simply unappealing. The love triangle that forms between the three becomes the center of the plot, but unfortunately they don't really have much chemistry together, though, again, the sequences with Baxter prove to be the most engaging. Despite the inclusion of some impressive (for the time) outdoor cinematography shot on location in Utah, the film still retains a very stage production feel in between its relatively brief excursions to exterior settings. To this end, most of the runtime is made up of simple conversations, often framed in wide masters and two shots, and these dialogue heavy scenes prove to be rather dull and plodding –- both visually and narratively. Furthermore, the pace really hits a snag in the second act with very little momentum in the on screen story bringing things to a halt. Thankfully, the action does eventually perk up as the climax approaches. There is also some amusing pre-code innuendo that adds a little spice to the otherwise boring scripting. Though the visual style is mostly static and simplistic, there are a few sparse camera movements that add some very welcome but fleeting variety to the proceedings, and the framing helps to engender a great sense of space in the outdoor locations. Admittedly, a lot of the film's underwhelming visual and technical innovations must have surely seemed genuinely appealing and groundbreaking at the time of release, but there's no denying that the picture hasn't exactly aged well. The film ends with a twist (an O. Henry trademark) but this development is rather predictable and the execution of the Cisco Kid's plan is kind of silly and cold blooded. The story ultimately addresses concepts of betrayal, but these themes are very underexplored and skimmed over, and the more engaging third act doesn't come close to making up for the arrested plotting that leads to it. While there is some value in the technical innovations on display, they've lost most of their luster and the film's style as a whole is (understandably) static. 'In Old Arizona' received plenty of recognition when it was released in 1928, but this is one classic that hasn't fully stood the test of time. 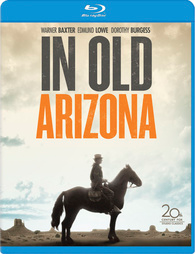 20th Century Fox brings 'In Old Arizona' to Blu-ray on a BD-25 disc housed in a keepcase. After some warnings and logos the screen transitions to a standard menu. The release is region A coded. The movie is provided with a 1080p/AVC MPEG-4 transfer in the 1.20:1 aspect ratio. Unfortunately, unlike some other classic films, 'In Old Arizona' does not seem to have been given an extensive restoration, leading to an authentic but rough presentation. The print shows frequent signs of damage throughout revealing streaking vertical lines, specks, dirt, scratches, and tears. Contrast pulsing and stabilization issues are also present. While always visible to some degree, the wear doesn't quite ruin the image and the film is still very watchable. A moderate to heavy layer of course and faintly fuzzy grain is also retained. Though decent, detail is on the soft side, and the picture frequently holds a slightly blurry quality and comparatively flat appearance. Aside from the aforementioned pulsing, the grayscale is natural and well balanced with even whites and solid blacks. At times the image here looks more like the "before" shots on many classic film restoration demonstrations, but despite the apparent damage, the video transfer remains adequate. The film is presented with a restored English DTS-HD MA mono track and an unrestored historical Dolby Digital mono track. Optional English SDH and Spanish subtitles are also available. Sadly, both tracks have their fair share of problems and do detract from the experience. The restored track is nice and clean and is virtually free from any pops, crackles, or hissing. Unfortunately, dialogue is extremely muffled -- at times to the point that it becomes nearly indiscernible in some sequences. The rest of the track sounds just fine with decent reproduction of the film's very sparse effects work and music, but dynamic range is flat and fidelity is thin. On the opposite end of the spectrum, the lossy unrestored track features a steady stream of background hiss and static along with occasional crackles and pops. With that said, dialogue is actually more clear and precise. Though the lack of age related issues on the restored mix is a plus, the muffled speech really can be troublesome and might hurt one's enjoyment of the film. Viewers might actually be better off going with the historical track, but even then the mix is prone to a different set of problems. Disappointingly, whichever option you choose, the audio is rather lackluster and problematic. 'In Old Arizona' certainly holds significance within the evolution of the motion picture medium, but outside of its technical milestones, the movie hasn't aged as well as other truly lasting classics. The video transfer shows a fair amount of damage but is still watchable. Unfortunately, both the restored and unrestored audio mixes present some notable issues that do detract from the movie. With no supplements and a lackluster technical presentation, this is a release that will only appeal to big fans or collectors of classic cinema.